Can also be used for making flavoured ice cubes, crayons, soaps, bath bombs, candles and more! We've had EXCEPTIONAL FEEDBACK so far for these brand new Gummy Bear Molds and we are confident that you will be delighted too! But HURRY as stocks are selling fast & won't last! ORDER NOW to avoid disappointment and enjoy the benefits of candy making with these fantastic molds! 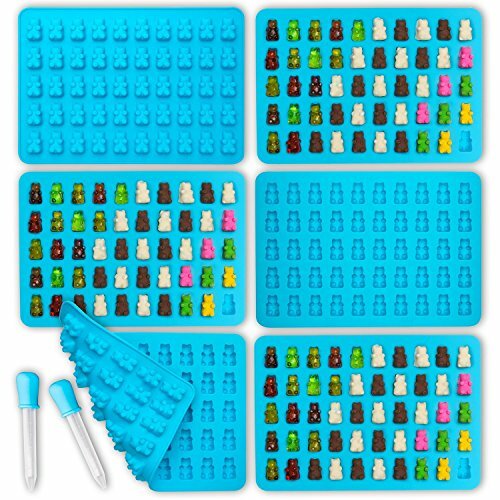 AWESOME GUMMY BEAR CANDY MOLDS WITH DROPPERS - For making up to 300 cute mini 3D gummy bears at a time! Suitable for making a variety of homemade treats - whether it's colorful hard candies, candy melts, chocolates, mints or fudge! Make your own all-natural gummy bears for peace of mind, knowing they contain no artificial ingredients. Perfect for birthday cake, cupcake or cookie decorating, adding wow factor to your baby shower candy buffet, or making cool candy bags as wedding favors! FEATURES - These brightly colored candy molds are made from premium, super soft FDA grade silicone and are also BPA free. They are heat resistant to 475F so you can fill them with piping hot chocolate or candy. Cleaning them is super easy, either with warm soapy water in the sink or throw them in the dishwasher! EXTRA FEATURES - These molds are flexible, non stick and easy grip. Don't worry if you accidentally hit, bump, or drop them - they are designed for durability and longevity so they won't break. Not only do these molds hold their contents stable to ensure your gummy bear treats set just right, it's also extremely easy to release them afterwards! All in all one of the best candy making tools on the market right now! VERSATILE - Whether you're baking, refrigerating or freezing these molds, they work great! As well as being excellent for making sweet treats, they can also be used as a flavoured ice cube maker and for making fun crayons, soaps, bath bombs and even bear shaped candles! FULL LUCENTEE WARRANTY - Our promise to you! If you are not satisfied with these Silicone Gummy Bear Molds, we will provide a FULL refund or replacement without any questions asked! This makes your purchase absolutely risk-free and you can enjoy testing out their quality and durability! Purchase these molds today while stocks last by clicking "Add to Cart" above.